In college, you will probably have classes with thousands of different people, and odds are, that some of these people are going to drive you, your fellow classmates, or your professor crazy. Whether they do this by talking throughout the lecture or by snoring through it, they definitely exist on every college campus and you are sure to encounter them. Here is a list of the students to look out for in your classes. They are everywhere, and they are sure to make your college life quite an experience. This student always manages to disrupt the whole class with their perpetual tardiness. They cause everyone, but the professor, to stare at them as they stroll in late, and in doing this, they cause a large majority of the class to miss what the professor (who refuses to stop lecturing during this distraction) just said. They also never seem to just sit at the end of the row; they always cause ten people to adjust themselves ,so that they can slide past to the one specific seat in the middle of the room. If you can help it, please try not to be this person. Yes, we all tend to get hungry in class, but this student just can’t seem to survive without eating every 50 minutes. They always bring a ton of food to class, and their snacks are never ever quiet. They never seem to bring an un-disruptive snack like a banana or string cheese; they always bring something crunchy with a noisy wrapper that takes twenty minutes to open. These students are the kryptonite of people (like me) who can’t stand eating noises. This student constantly volunteers to read the passage on the projector, and always stumbles through the entire thing. If you have a person like this in your class, you quickly learn that you can read a passage 3 times before they get through it once. This may even motivate you to volunteer to read, just so they don’t get the chance. You will find yourself wishing that the teacher wouldn't pick this student to read and that the student was a little shyer. Some students just can’t help but shake their legs up and down for the duration of the class, and most of them don’t realize that they are doing it. However, it can be very annoying if you choose to sit next to this person. They manage to shake the entire row of lecture seats that they are in without even noticing. You better watch out for this kind of student because they are very common. This student just can’t stick to a spot and causes everyone in the area to sit in a different seat. Seat hoppers throw off the rhythm of the class, and during test day, they can completely throw you off. We all know this person. They click their pens a thousand times, drum their pencil on their notebook, and talk to anyone who will listen. They are super common and they are very noisy. They use noise to keep themselves entertained, and in turn, they distract everyone. This is probably the most entertaining type of student. They continue to nod their heads up and down throughout the lecture, and sometimes they even snore, causing the whole class to laugh. They can be annoying, but they can also be very fun to watch in a less-than-entertaining lecture. We all get tired in class, but this person is basically paying for a glorified nap break. All in all, it’s probably a good thing that we have to deal with these types of people while in college as it prepares us for the grown-up nuances we'll have to deal with in the workplace. 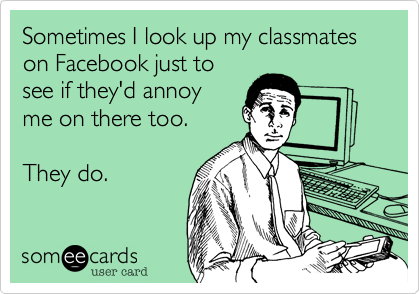 And though it doesn't make these "bad habits" any less irritating, I hope this article gives you some comic relief, so when you encounter these kinds of students, you can see it as slightly funny instead of ridiculously annoying.